Very little change on the yen to dollar daily chart with Friday’s candle once again reinforcing the consolidation of the currency pair finishing the day in a narrow trading range and with shadows to both top and bottom. This currency pair remains one to avoid for the short term and indeed like many others is now waiting for a catalyst to ignite the broader markets. This may well occur later in the week from one of several different directions but the most likely of these will be any one of the following: the FOMC statement, US GDP numbers and the result of the US Treasury Auction. 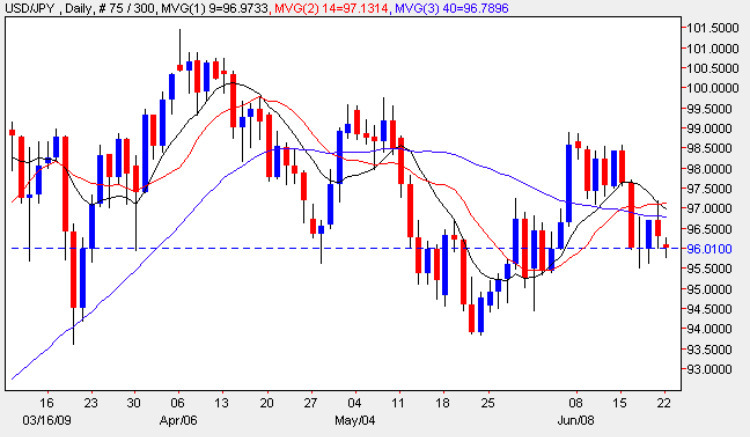 We have had two minor items of news on the economic calendar for the Japanese Yen overnight with the BSI Manufacturing Index and Tertiary Industry Activity, both of which suggested that business confidence is beginning to improve.